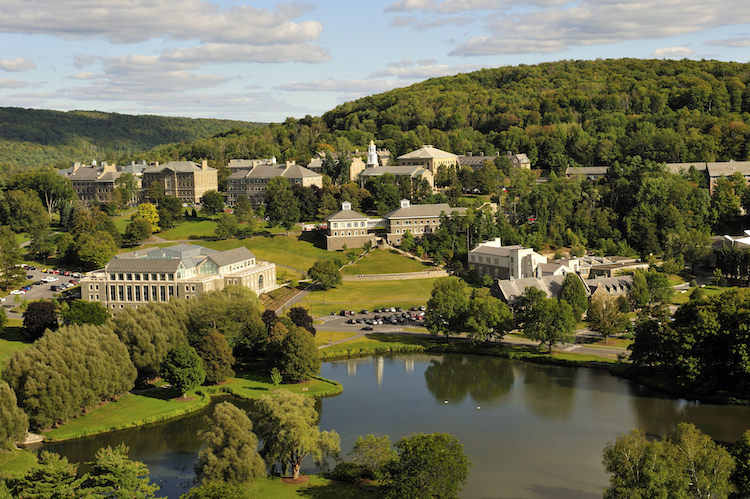 Editor’s note: Wondering what’s happening in the classroom at Colgate? Here’s a real-time glimpse into academic life on campus — a syllabus from a course underway this semester. The main aim of this course is to guide you in achieving an understanding of important current topics in cosmology and being conversant on the topic. The first part of the course will will focus on the “basics,” i.e. general relativity. For this part, there is no required textbook, and your notes from lecture and discussion should be sufficient. Our goal in this course is to take an in-depth look at the fundamentals, while not losing sight of how these inform a broad understanding of cosmology. The course will be a mix of activities, centered on lecture/discussion classes and incorporating discussions of recent cosmology discoveries. Full and accurate calculations in most modern cosmology problems are usually done using sophisticated numerical methods. This class, however, will not focus on numerical techniques. We will instead take an analytical approach, recognizing that, on occasion, we will be forced to introduce approximations. The majority of the cosmology topics we will cover in this class are aimed at providing an understanding of the benchmark Lambda-CDM cosmological model and how observations can be used to constrain its parameters. By the end of the semester you should have a good understanding why dark energy and dark matter are thought to be the main ingredients of our universe. In addition to a traditional final exam and midterm, all students must complete a final presentation that accounts for 10 percent of their grade, in which each student is required to give a solo presentation about a topic of cosmology from their independent studies throughout the course, as per discussions with the professor. Topics are encouraged to be drawn from student-led Cosmology in the News each Thursday, where selected students introduce the rest of the class, during a brief period, to a recent paper on astrophysics or cosmology and explain the relevance of the paper and its discoveries. Introduction to Cosmology (2nd Edition) by Barbara Ryden. “In this course, students achieve a progressively deeper understanding of what has been called the most elegant theory in physics: Einstein’s theory of gravity (also known as general relativity). During the second half of the semester, we apply this theory to explore the theoretical models that best fit and explain available cosmological data for our universe.